Development of strategy, concept, and formulation of the manual “Guidelines for Sustainable Reconstruction in Tsunami Affected Areas” for project managers to reduce natural disaster risks, mandated by UNEP. 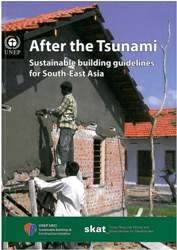 UNEP commissioned Skat to prepare a manual on sustainable reconstruction, in particular, in the context of Tsunamis and other natural disasters. The manual provides guidance in identifying conceptually sound, robust and practical reconstruction solutions that minimise environmental impact. The guidelines cover various aspects of sustainable reconstruction, including planning, design, materials, implementation, and maintenance. In the aftermath of the Tsunami disaster, numerous agencies have responded by reconstructing houses and infrastructure. Project managers, however, are often overwhelmed not only by the volume of required activities but also by the extent of challenges related to reconstruction. One of the challenges is to ensure conceptually sound, robust and practical reconstruction solutions that will minimise environmental impact. This manual addresses that challenge by providing project managers with guidance in various aspects of sustainable reconstruction, including planning, design, materials, implementation, and maintenance. The manual includes the areas of adequate site selection, construction technologies and their social acceptance, cost-effectiveness and affordability of housing, technical infrastructure and access to information.